While working in the beauty business for the past 31 years, I’ve grown with my clients and had first hand experience with the challenges that come with aging and the effects that this has on our hair. To date, at age 51, I have noticed a change in the density and feel of my hair as well as my clients’. Due to the pigment loss and the ability for the hair to maintain moisture as we age, many of us are noticing that our hair is dryer and also getting thinner. Many have turned to color treatments and services to help with the pigment loss and deep conditioning treatments and services to help hair retain moisture but have yet to find a product that helps to actually retain the thickness of the hair. I attended Aveda’s annual convention (Congress) in Minneapolis at the Aveda headquarters this past October. At that time they announced the launch of a new product line called Invati which is formulated to protect against thinning hair. The system includes an exfoliating shampoo, a thickening conditioner, and a scalp revitalizing spray. The main ingredients are ginseng and tumeric which naturally work together to help energize and rehablilitate the scalp around hair follicles when massaged into the scalp. 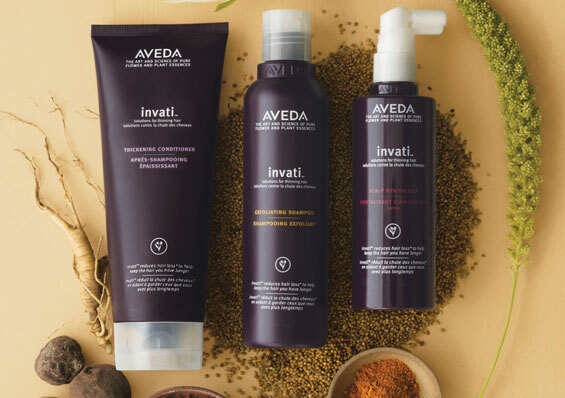 Aveda found that after using the product system dilligently that you will reduce hair loss by 33% and the volume of each hair will increas by 7%. You will see results in about 12 weeks. This product is not only for those who are currently facing the complication of hair loss but also for those who are concerned about thinning hair in the future. Immediately I thought of clients, friends and family that would greatly benefit from this product. Since I was traveling I was only able to bring 5 systems home. I gave one to my daughter as she had just had a baby and if she would take after me then she would notice a dramatic increase in hair loss about 3 months after giving birth. I also had my husband and son in law use the system, as well as a three of my clients. I have to admit that I have not been very dilligent with using the products but I am certainly noticing excellent results. We anticipate the product line to sell out very quickly so we have pre-ordered a large stock and are accepting reservations for our clients. There is no deposit required. Please let us know during your next visit or call us to reserve your system at 845-635-1626. 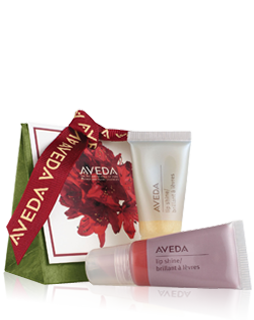 AVEDA Holiday Gift Sets Help Give Back! The gift sets are perfect for everyone on your list! From various limited edition sized shampoos, conditioners, and styling products- to hand & foot relief sets- to mini lip gloss sachets. Stop in to say “Hello” and check out these holiday items! We look forward to seeing you!